The new Andrew Jackson Arts Focus Center will open Fall 2019, despite delays caused by the rainy weather and by a redesign of the parking and entrances. • classrooms large enough – and designed for – arts focus programs at the middle and high schools. Work on the three new entrances is complete, improving traffic flow during student drop-off/pick-up and giving traffic to the schools room to stack off HWY 521. Canopies connecting the arts focus center to the two schools will be installed. Doors and door locks have already been replaced and athletic facilities upgraded as part of the improvements made possible by the bond. 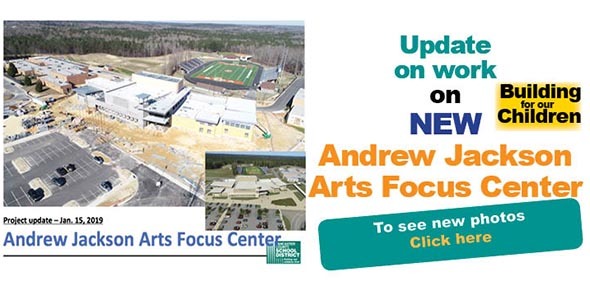 • Click for photos of Andrew Jackson Arts Focus Center project.